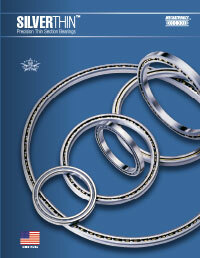 Don't forget to consider moment loads when specifying thin section bearings. What is a moment load? A moment load is a tilting load that attempts to rotate the rings of a rolling element bearing in a rotational manner perpendicular to the designed rotational axis. Single ball bearings aren't usually designed to handle moment loads, but Silverthin offers engineered solutions for space and weight limited applications. To further explain, a moment load may also be thought of as a "torque". A "moment", or "torque", is a force (or load) acting at a specified distance from a specified point. For example, when you tighten a bolt using a wrench, the resulting "moment" is the product of the amount of actual force you exert on the wrench multiplied by the distance from the center of the bolt to the position of your hand on the wrench. In the case of a bearing, a moment load is a multiple of the distance from the center of the bearing and the force acting on an arm. Most designers are familiar with bearing applications having multiple bearings (2 or more) that work together to accommodate the loading in the system. The resulting bearing loads in these cases are typically analyzed as radial or thrust loads when evaluating the bearing system. However, by only having a single bearing, any radial load in a system acting anywhere other than at the center of the bearing ball path will generate a moment load. 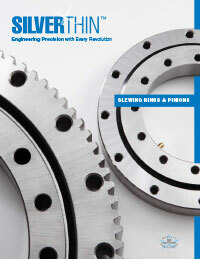 SilverThin offers bearings from stock that are specifically designed for applications with significant moment loads, where there are space, weight and cost saving benefits of using a single bearing. These are unique and specially designed single row, thin-section ball bearings where the internal geometry of the race is reminiscent of a gothic arch, also known as an "X-Type" design. When only one bearing is in a system, as is also the case in many slewing ring bearing applications, any load can generate significant moment load. Large moment loads often occur when an apparatus extends from a platform with a slewing ring or thin section bearing at its base. A simple example might be that of a robotic arm extending a few feet from a stationary base to pick a heavy object and turn it. 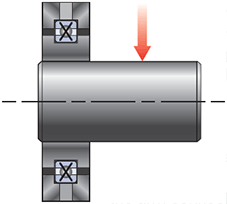 The thin-section or slewing ring bearing at the base of the arm connecting it to the platform experiences a moment load.